For 2019 the Pioneer 1000 returns with six models—the Pioneer 1000-5; 1000-5 Deluxe and 1000-5 Limited Edition; and the Pioneer 1000, 1000 EPS and 1000 Limited Edition. The Pioneer 700 line-up returns with four model choices—the Pioneer 700, 700 Deluxe, 700-4 and 700-4 Deluxe, and the Pioneer 500 returns as well. The 1000-5 Deluxe comes in red, Black Metallic and Honda Phantom Camo (HPC) for 2019, whereas it came in red, Active Yellow and HPC in 2018. LED headlights and two-tone aluminum wheels are Deluxe extras. Prices start at $17,899. Pioneers 1000s return with the market’s only six-speed dual clutch transmission (DCT) gearbox mated with a 999cc parallel twin with Unicam heads, like Honda’s revolutionary CRF dirt bikes, that use high-tech roller rockers to reduce friction with the cam. The engine is placed longitudinally in the chassis for a more efficient and simple driveline, and rubber engine and exhaust mounts reduce vibration and noise. The DCT monitors throttle position and input, engine rpm, vehicle speed and brake input to determine driving style. Relaxed driving causes the DCT to maintain low rpm for a quiet, fuel-efficient ride, while aggressive driving brings high-rev operation for maximum power and torque. Inconsistent throttle brings on transient-detection mode that avoids multiple shifting. The base 1000 comes in red, olive and Active Yellow, while the EPS version comes in red, Active Yellow and HPC with tilt steering wheel and EPS with kick-back control. Prices are $14,699 and $15,899. EPS, Deluxe and LE models have a sport-mode switch and manual paddle shifters, and changing DCT modes alters delivery from quiet and relaxed to exciting and powerful. Even in automatic mode, the driver can over-ride advanced shift logic by using the paddle shifters. Both Limited Editions also sport I-4WD; the intelligent differential system combines 4×4 and diff-lock functions into single selection mode, and I-4WD uses an industry-exclusive off-road brake traction control system to give more traction to the tires with the most traction. LE models also have a hill-start assist that keeps the brake on while the driver transitions to the throttle and also distributes front and rear braking force on panic stops. Both the 1000 and 1000-5 come equipped with independent suspension with 10.6 inches of front and 10.0 inches of rear travel, along with 27-inch tires and four-wheel hydraulic brakes with 210mm rotors. Wheelbase is a class-leading 80.2 inches for the Pioneer 1000-5 and also the three-person 1000. EPS versions have a high-tech electronic power steering system that reacts to vehicle speed and steering input to reduce driver fatigue and terrain kick-back, along with a tilt steering wheel. All 1000-5s except the LE have a self-leveling rear shock system that automatically levels ride height for any load. LE models sport Fox Podium QS3 shocks for quickly tuning damping to match terrain or driving styles, a beefy front bumper, and aluminum A-arm guards and skid plates. LE models also sport new cabin-storage compartments, cup holders in all four doors, illuminated dash switches, painted bodywork, matching suspension arms and shock springs, and trick aluminum wheels. Pioneer 1000 prices start at $14,699, a $200 increase. 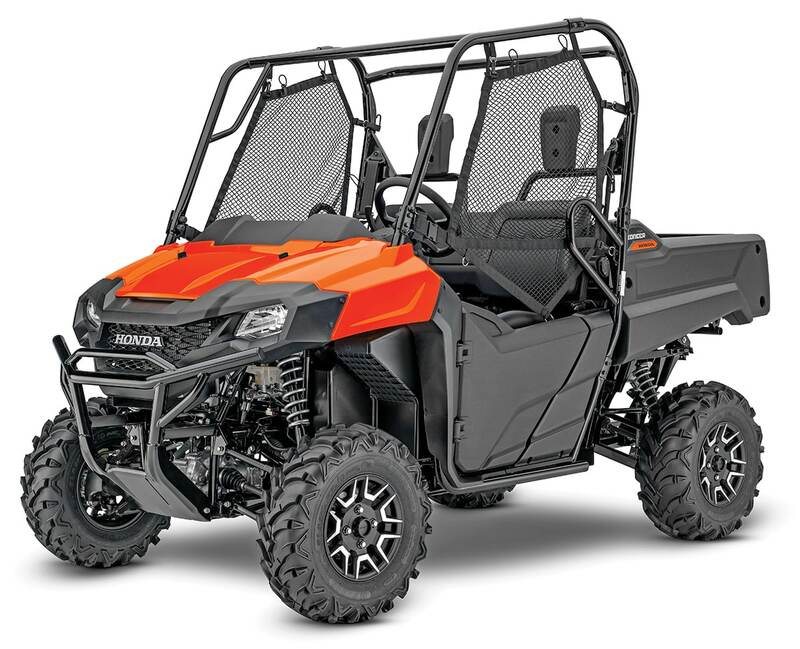 The base Pioneer 700 comes in Olive only, while the Deluxe sports Pearl Orange paint or HPC wrap, new two-tone aluminum wheels, variable-assist EPS and automatic three-speed transmission with manual over-ride paddle shifters. 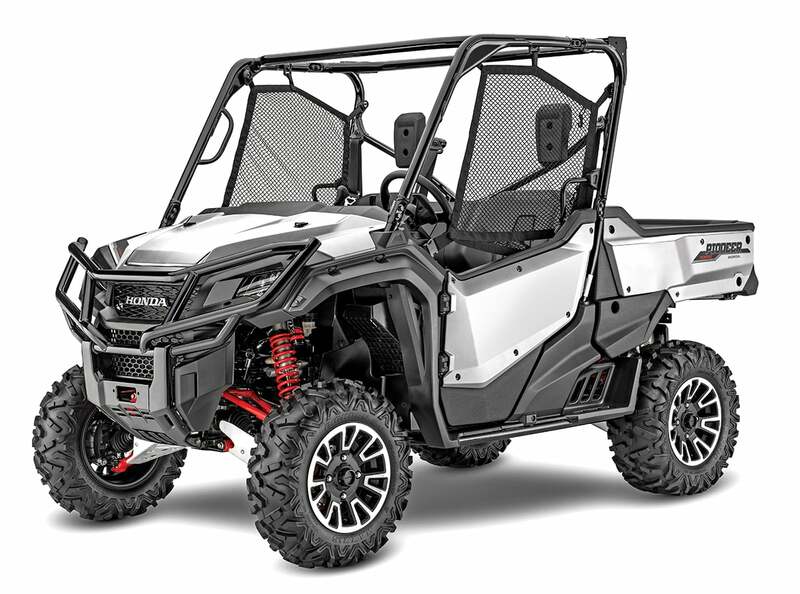 The four Pioneer 700 models share a 675cc over-head valve single with four-valve head, 102mm piston, 82.6mm stroke, 9.2:1 compression and one 40mm EFI throttle body. An automotive-style hydraulic torque converter controls three forward gears and reverse. Front travel is 7.9 inches, while rear travel is 9.1 inches. Wheelbase is 76.8 inches, and tires are 25-inch on 12-inch rims. Diver Blue paint is new to the 2019 700-4 Deluxe, or get it with Honda Phantom Camo. All 700s have hydraulic brakes with two 200mm front rotors and one 170mm rear disc. Expect them to start at $13,899. Like the Pioneer 1000-5, the 700-4 has QuickFlip rear seats that stow to form a flat bed or flip up to provide seats for one or two rear passengers. With either flipped up, the bed is locked in place for safety, but it can be tilted with both stowed. Bed capacity is 1000 pounds, and towing is 1500 pounds, while Pioneer 1000s tow a ton. 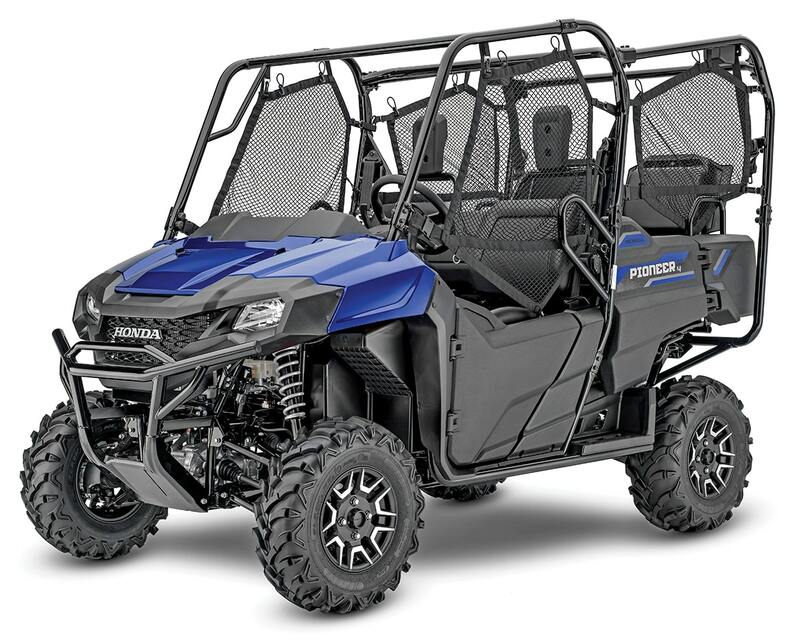 Pioneer 700 and 700-4 Deluxe models sport variable-assist EPS, painted bodywork, and new two-tone aluminum wheels, even on the Honda Phantom Camo versions. Deluxes also sport a manual-transmission switch on the dash for sporty driving with paddle shifters, and the paddles over-ride gear selection in automatic mode. The Pioneer 700 starts at $10,799, a $200 increase. 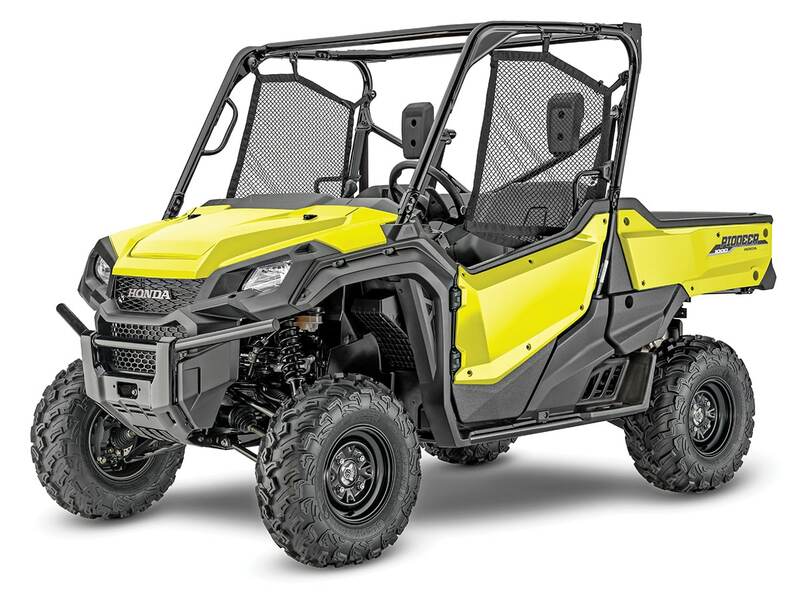 The sporty 50-inch Pioneer 500 returns with paddle shifters and five color choices—Active Yellow (new), Olive, red, white (new) and Honda Phantom Camo. Prices are to be determined; the 2018 started at $8999 with Camo costing $9599. 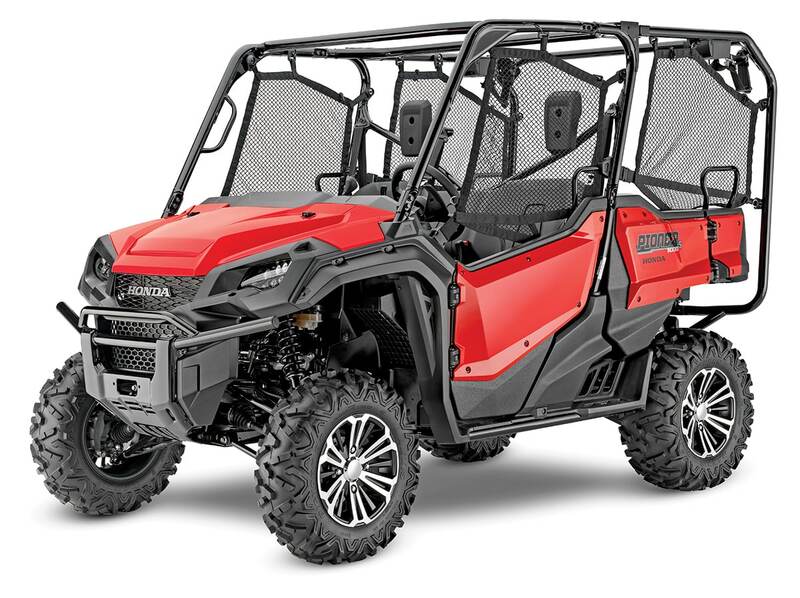 Honda’s entry-level UTV returns with a 475cc single powering a five-speed automatic transmission that can be over-ridden and shifted via paddle shifters on the steering column. 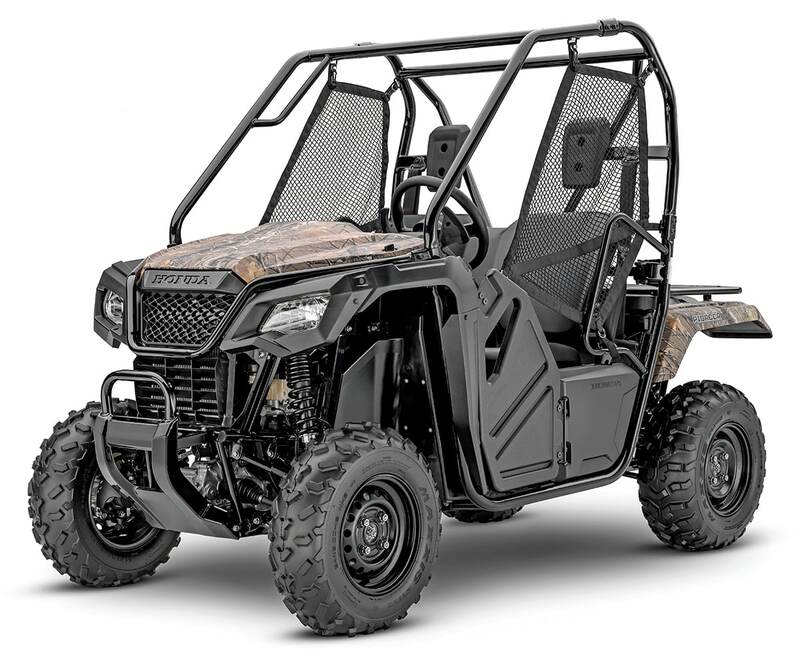 It has a 73.1-inch wheelbase, 50-inch width for use on Forest Service ATV trails and hauling in a standard-sized pickup, and hydraulic front and rear disc brakes. The doors and nets open as one via a twist-action door-release knob, and HPG shocks with dual-rate springs deliver a plush ride with 5.9 inches of front and rear travel. A large rear rack holds 450 pounds of cargo, and it tows 1000 pounds.